What Is More Important to Swimming: Your Legs or Arms? Swimmers sometimes debate the importance of legs versus arms in swimming but neglect the significance of what connects the limbs together. Your core or trunk generates the lift and speed that distinguishes an elite swimmer from an average one. The relative importance of arms versus legs in swimming depends on which swimming stroke you are performing. The large muscle groups in your torso -- specifically those in the hip, pelvis, abdomen and lower and upper back -- make up your swimming core. When you swim freestyle, the large muscles in your trunk, or torso, should generate power and transfer it to your arms. You draw strength from the pectoralis major in the chest area and the latissimus dorsi in your upper back. Your obliques play a critical role in maintaining correct body position and initiating the body roll essential to freestyle. Your hip flexors allow the undulating motion needed for kicks in butterfly and breaststroke. Freestyle and backstroke both rely mostly on your upper body for propulsion. Your arm position and turnover rate both influence how fast and efficiently you swim. An early vertical forearm on your entry arm helps you set an anchor point in the water and engage the large muscles in your back to power your stroke. To obtain an early vertical forearm in freestyle, bend your elbow soon after your arm enters the water, so that your forearm is perpendicular to your upper arm and your fingertips point downward. Breaststroke primarily is a leg-driven stroke and butterfly relies on both a strong kick and undulating body position. Both strokes require strong hamstrings and glutes to complete the kick cycle, but both also rely on strong and flexible hip and abdominal muscles. Timing the breaststroke kick challenges beginners who typically rush the kick to coincide with the pull. The short pull should complete and resolve into a streamlined glide before you power your stroke with the frog-style kick. Engaging the core muscles in your body helps you avoid injury as well as swim faster because the large muscles are more resilient to repetitive use and receive ample blood and oxygen supply. Rather than pulling faster or harder or kicking frantically, focus on coordinating your movements so your body moves as one unit, synchronized to maximize speed and minimize fatigue. What Is Sculling in Swimming? 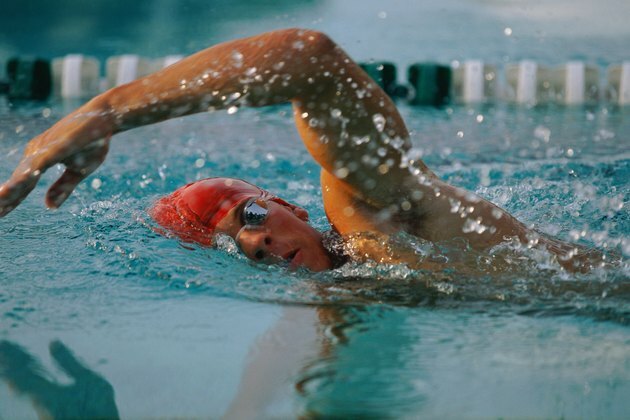 What Muscles are Used Swimming the Butterfly Stroke?